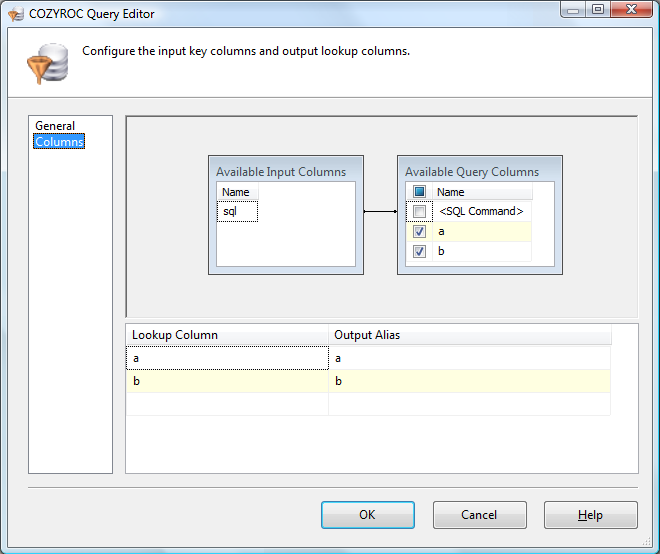 The Query Component is an SSIS Data Flow Component providing the ability to retrieve data from a SQL database by defining data flow input columns as query keys. The Query component supports a variety of connection types as a source. The General page is used to define the component source database and statement. Click New to create a new connection manager. Select an existing table or view as the query source. 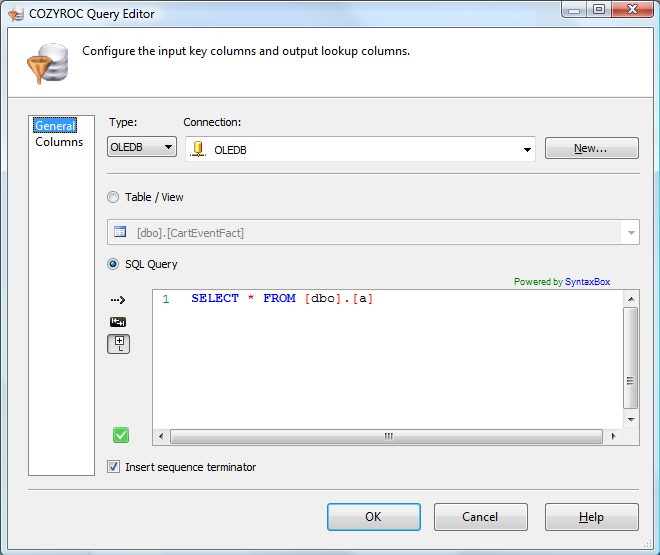 Specify an SQL statement as the query source. Indicates whether an empty line should be inserted at the end of each set of records returned by the query. The default is true. True Empty line will be inserted. False Empty line will not be inserted. The Columns page is used to set up the query key columns and output columns. List of available input columns from the upstream data flow component. Connect only the key column(s) to available lookup columns to use as query key columns. List of available columns in the records being searched. Use the check boxes to include columns in output. is a special query column. This allows you to provide a SQL statement from upstream to be used for the query. Map it to the input column containing the statement to populate the SQL statement the Query will use with content from the input row. Select lookup column to include in output. Specify output column name. The default is the name of the lookup column. Where can I find the documentation for the Query? Fixed: Failed when input lookup parameter was NULL (Thank you, Don).